Live delivery is guaranteed when requirements on this page are met - please read carefully! Live delivery guarantee applies ONLY to orders shipped via an OVERNIGHT SERVICE. Live items shipped via 2-Day or Ground service are never guaranteed - not for live delivery, timely arrival or damage to package or contents. Live delivery guarantee applies ONLY when temps are below 95º and above 25º. Guarantees are suspended (shipments are NOT guaranteed) if your order is exposed to temperatures above 95º F or below 25º F at origin location (our facility), while in transit (carrier hubs), or in your delivery area. Accepting our Terms of Service at checkout indicates you understand this policy and you accept full risk for your order. If you are not willing to accept the risk for your shipment, please wait until weather conditions become more favorable before placing your order. During the winter months, if your insects arrive cold and APPEAR to be lifeless, place the box in a warm area (80º F if possible) and inspect after about an hour. VERY OFTEN the insects are just chilled and will are fine once they warm up. If you receive a shipment that is dead or damaged e-mail websales@ghann.com immediately with the word "REPLACEMENT" in the subject line. 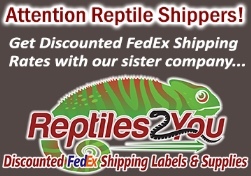 We must be notified within 24 hours of package delivery in order to consider replacement. Problems communicated to us more than 24 hours after delivery are NOT eligible for replacement. In the case of a lost or missing shipment please notify us within 24 hours after the scheduled delivery time so that we can issue a tracking alert on your package. If it does not arrive in good condition you will be eligible for a replacement. Someone must be present to receive and inspect the package when it is delivered. If you are not going to be home consider having your package shipped to your workplace, a neighbor who might be home, etc. If the carrier reports delivery as "left at door", etc., the package will NOT be guaranteed and you will NOT be eligible for a replacement. *EXCEPTION - we know that occasionally delivery personnel might leave a package unannounced. If you are expecting a delivery, please check your doorstep frequently to see if a delivery has been made. If you have a DOA shipment, and you e-mail us within one hour of the delivery time-stamp, we will make an exception to our policy and offer a replacement even if the delivery info states that the package was left at the front door without personal receipt. Your e-mail must be received by us within one hour of the recorded delivery time for this exception to apply. Even if a package is damaged or the insects inside appear to be dead, always accept the shipment - do not refuse a package under any circumstances. REFUSING A PACKAGE WILL VOID YOUR GUARANTEE AND YOU WILL NOT BE ELIGIBLE FOR A REPLACEMENT. After accepting your shipment, if the product is dead or damaged e-mail websales@ghann.com immediately with the word "REPLACEMENT" in the subject line. We must be notified within 24 hours of package delivery in order to consider a replacement. Problems communicated to us more than 24 hours after delivery are NOT eligible for replacement. US Postal Service delivery is not as reliable as private carriers (e.g FedEx) and therefore more risky for live products. USPS tracking is not as detailed or reliable as private carrier tracking, and packages are sometimes completely lost. For these reasons, we do not ship via the US Postal Service.